Plantains are similar to the common banana in shape and texture, but are wider with lower sugar content. 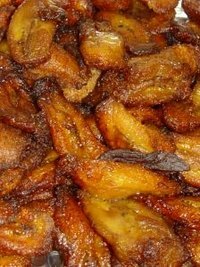 Unlike the banana, considered a fruit or desert item, people in parts of South America, Africa, southern India and especially in the Caribbean usually grill or fry the plantain and serve it as a staple food. Take a look at the plantain, its traditional uses in cooking and some dishes you can make with plantains. Plantains are of the genus Musa and the species paradisiaca. They make up a large portion of the daily diet in many parts of the world. Next to a banana, a plantain is considerably larger. People generally do not eat them raw or alone, without preparing them in some way first, because they lack the sweetness and velvety texture of bananas. In the Caribbean, especially Cuba, and parts of South America, the plantain is a primary staple food much like the potato is in Europe and the United States. Plantains are usually boiled or fried when unripe, when they are green in color. Since they are larger and contain more starch and less sugar than bananas, they make a perfect source of basic calories. When twice-fried like chips, plantains make a snack richer than the potato chip, called "totones" in Costa Rica, Columbia and other parts of Latin America. To fry plantains, you don't need complicated ingredients or tools. Peel green, not-fully-ripe plantains and slice them diagonally. Next, heat a shallow level of canola or other cooking oil in a frying pan and stir the plantain pieces over the hot oil until they are brown and becoming slightly crispy on the edges. Add a little salt or sugar, or both, if you desire. But even without spices, fried plantains make a tasty snack or side dish. Many cultures use other parts of the plantain plant besides the fruit. In southern India people use the leaves as plates in traditional dishes. Peruvians cut up plantain leaves and use them in place of corn stalks for wrapping tamales. In parts of Africa, people cook and eat both the soft central plant stalk and young shoots. Where Can I Get Plantains? Recipes calling for plantain will not turn out right if made with common bananas. However, you might not find plantains at standard grocery stores. If you want to make a recipe with plantains look for them at stores specializing in African, Carribbean or especially Hispanic foods. Also, most natural foods stores such as Whole Foods carry raw plantains. What Country Consumes the Most Bananas?